Coming off a record year with the best overnight results in a quarter of a century, Canadian travel to Switzerland shows no signs of cooling off. In fact, numbers for the first half of 2018 show a 3.9% increase in overnights and a 4.5% boost in arrivals, with Ontario, Quebec, and British Columbia being the strongest source markets. 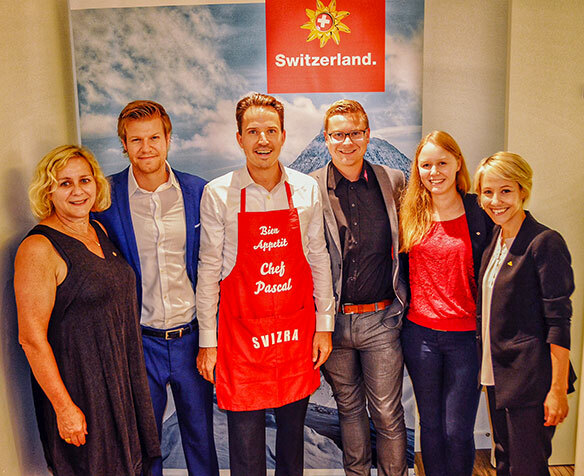 To celebrate the continued growth and to launch the upcoming winter season, Switzerland Tourism recently held an après-ski style raclette dinner in Toronto to showcase what makes the European destination hot, like milder temperatures. As for other reasons why Switzerland is a great winter destination, he pointed to the number of winter sports, its close proximity and affordability, Christmas markets, spa and wellness, winter romance, convenience, and maybe even some attractive ski instructors, he joked. 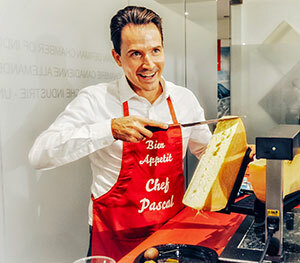 Chef Prinz serves up some cheese raclette. Several tourism partners were also on hand to provide updates on the latest things to do and what’s on offer in the destination. Nathalie Rothlin, manager markets for Interlaken Tourism, said there are a variety of adventure sports, skiing, paragliding and kayaking on the lake between high mountains that await visitors during the wintertime. “What’s new to do in our region since this year, we have ‘backpack for fondue,’ so you find all the stuff you need for having a fondue out in the nature in a backpack, you can carry it, have a glass of wine, have the cheese, at your favourite spot – even on a winter hike or while skiing,” she said. Meanwhile Samuel Bohren, sales manager for Schilthorn – Piz Gloria, said 2019 will mark the 50th anniversary of when James Bond skied down the nearly 3,000 metre-high summit of Schilthorn in the 1969 007 film On Her Majesty’s Secret Service. “You can ski all along the slopes and just feel like James Bond, getting this beautiful view with a touch of James Bond… that’s the ultimate experience,” he said. Some scenes from the film were also shot at the Piz Gloria, the restaurant located on top of Schilthorn, which serves up a daily James Bond Brunch. As for the Matterhorn Region, director of sales and marketing North America Virginie Baerswyl Koulibaly said the biggest news is the Glacier Express Excellence Class, which is launching next March.